Orlando, FL real estate professionals Steve Amburgey and Jeffrey Funk win the coveted diamond award which is Realty Executives International's top honor for real estate professionals. 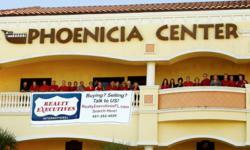 The Realty Executives Central Florida office is located in the heart of Doctor Phillips in Orlando, Florida. Realty Executives is a brand to trust, and we are a group of Realtors® with a track record that speaks for itself. Realty Executives Central Florida has once again demonstrated its unwavering commitment to Orlando real estate by providing home buyers and sellers with the highest level of service and professionalism the industry has to offer. Two of the agency’s Realtors®, in fact, were recently awarded top honors by Realty Executives International. Jeffrey Funk and Steve Amburgey both received the coveted Diamond Award for 2011. This award is bestowed upon those executives that have grossed more than $250,000 in commissions. Both men were also recognized as being in the Top 10 percent of Realty Executives International worldwide. While Dollar is thrilled with the accolades her Realtors® have brought home to Central Florida, their accomplishments come as little surprise. Realty Executives’ dedication to delivering topnotch service and making sure clients are satisfied with transactions speaks to the experience of the agents within the company, she said. Realty Executives Central Florida specializes in properties of all types throughout the Greater Orlando area and beyond. The company’s Realtors® are experts not only in real estate, but also in the communities they serve. For more information about Realty Executives, visit http://www.realtyexecutivesfl.com online.